Today is the fourth 'Time to Talk Day' - held annually on the first Thursday in February. The aim is to get everyone talking to break the silence around mental health problems. Mental health problems affect one in four of us - yet people are still afraid to talk about it. For people with mental health problems not being able to talk about it can be one of the worst parts of the illness. So by getting people talking about mental health we can break down stereotypes, improve relationships, aid recovery and take the stigma out of something that affects us all. At Turn2us, we know how important it is to support such awareness campaigns and the help that is available to anyone affected by mental health issues. Many people who use our services have been diagnosed with mental health conditions. Plus debt, struggling to pay the bills and difficulties with benefits claims or fear of losing benefits are also all important factors that contribute to mental health problems such as depression and anxiety. Since Time to Talk Day first launched in 2014, it has sparked millions of conversations in schools, homes, workplaces, in the media and online. As a result of the day, people have felt able to share their experiences without shame for the first time and have started supporting those around them. After that first conversation, people feel more comfortable talking about mental health and more likely to talk about it again – that one chat can have a huge impact. "It's #timetotalk because if you say something, you realise how many people around you haven't, and needed to." 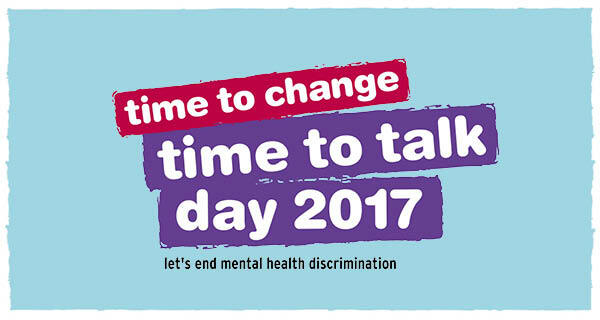 You can find out more about Time to Talk Day and other mental health campaigns on the Time To Change website. If you have an illness or disability, the Your situation: Ill, Injured or Disabled' section of our website has useful information on benefits, grants and other forms of support that may be available to you. You may also find other pages of the Your Situation section helpful, depending on your particular circumstances. If you are struggling financially, you can use our Benefits Calculator to check your entitlement to benefits and our Grants Search to see if you are eligible for help from a charitable fund, based on your personal circumstances and needs. We also have a Find an Adviser tool to help you find face-to-face advice in your local area. This includes local Mind and other mental health charities in your area.